RICHMOND, Va. (March 31, 2015) – The 2014-15 ECNL season is dedicated to celebrating the Amazing Young Women that have helped mold this league into the top female youth soccer platform in the world. As part of the campaign, the ECNL is encouraging amazing young women to share their stories. Sonian Bien-Aime is the current President of the Turks & Caicos Island Football Association. 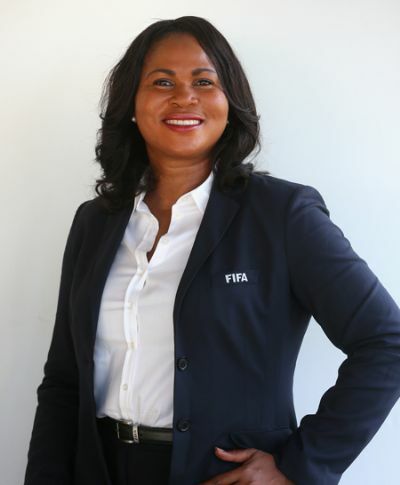 She also serves as an Executive Committee Member for both CONCACAF and FIFA. The ECNL caught up with Sonia to learn more about her and her new roles. Q: How would you describe a typical day in your shoes? A: When I am not travelling on football or personal business, my day starts with fitness and exercise at 5.30am until about 7.15am. I head to my office at about 8.30am where my day is usually absorbed by meetings, phone calls and catching up with everything else until late into the evening. Q: What organizations are you involved with? In what capacity? A: FIFA – ExCo Member, Deputy Chair of the U17 FIFA Women’s World Cup Organizing Committee, Member of the FIFA Women’s World Cup OC and Women’s Football, Member of the U20 FIFA Women’s World Cup OC and Member of the FIFA World Cup OC. CONCACAF – ExCo Member, Deputy Chair of Women’s Technical Committee and Women’s Championship Committee, Member of the Gold Cup Committee. Also honorary members of local organizations called Sister Sister and Women in Sports. Q: What is your favorite memory from your soccer career? A: Taking my first penalty kick in an international match against the Bahamas and scoring. A: Smokey’s Restaurant….he been serving the best local food for many many years. Q: When were you first invited to the Turks and Caicos National Team Camp? Q: How long have you been involved with CONCACAF? Q: If you could fly anywhere in the world, where would you go and why? A: Easter Island….It seems to be a very interesting place with amazing statutes and history. Q: What do you enjoy doing most with you family? A: Hanging out on the deck at a BBQ and sharing crazy jokes and conversations. Q: PB&J or Grilled Cheese? Q: What is your favorite quote? What does it mean to you? Q: How old were you when you started playing soccer? Q: Who is your favorite actor/actress? Q: What do you treasure most about your job? Q: If you could have one super power, what would you chose and why? A: To be able to speak all languages….I love communication and hate when I am not able to understand or communicate with people. Q: Do you have any superstitions that you follow? If so, what are they? Q: If you could have any job in the world, what would you chose and why? A: I have been an athlete from a very young age in my life and have always dreamt about a career in sports….I am doing what I love most in my current position.